5.1 Earthquake hits Timor, Indonesia. 5.0 Earthquake hits Kyushu, Japan. 5.0 Earthquake hits Kapulauan Tanimbar, Indonesia. 5.0 Earthquake hits the Babuyan region in the Philippines. In the South Indian Ocean – Tropical cyclone Adjali is located approximately 362 nm south-southwest of Diego Garcia, and is tracking southward at 07 knots. Kenya – Heavy rainfall caused a landslide in Limuru town in Kenya which claimed the life of a 14-year-old boy. 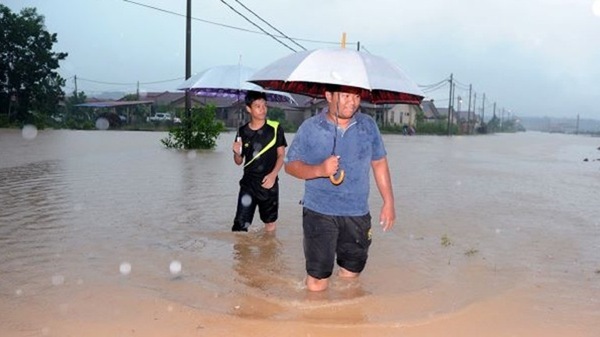 Malaysia – The flood situation in Terengganu worsened as the number of residents affected rose to 2,312 on Wednesday (Nov 19) from 67 on the previous day. Two rivers recorded a reading that breached the warning level, namely Sungai Chalok at Jambatan Chalok and Sungai Marang at Jambatan Pengkalan Berangan. WHO continues to closely monitor the H7N9 situation and conduct risk assessment. So far, the overall risk associated with the H7N9 virus has not changed. No cases of Ebola remain in the United States at the moment, but researchers are busy working on vaccines as the virus continues to spread in West Africa. In a few areas in Liberia, cases may be on the decline, new reports find. Researchers working on a vaccine against the Zaire strain of Ebola virus, which is causing the current outbreak, say that nearly 200 people have now received an experimental vaccine that was developed by the U.S. National Institutes of Health (NIH) and GlaxoSmithKline. The trial is a Phase I trial, meaning its goal is to test the vaccine’s safety (as opposed to looking at how effectively it may work). The trial’s participants include people in the United States, Mali, Switzerland and England, the researchers said in a statement on Monday (Nov. 17). So far, data is showing promising results, indicating that the vaccine will likely move into a Phase II trial, they said, which would continue to evaluate the vaccine’s safety as well as look at its effectiveness. The vaccine contains a cold virus that infects chimpanzees, along with a single gene from the Ebola virus, which the researchers hope will prompt the body to develop an immune response to Ebola. It does not contain infectious material, and people cannot catch Ebola from the vaccine, experts said. The researchers want to look at how the immune response of the Malian health care workers in the trial compares with that of people in England and Switzerland, by the end of this year. “If this vaccine is proven to work, it could help alter the dynamic of this epidemic by interrupting transmission to the health care workers who are most at risk,” Dr. Myron Levine, director of the Centre for Vaccine Development at the University of Maryland School of Medicine, said in the statement. Another Ebola vaccine, developed by NewLink Genetics, is also being tested in a human clinical trial. Doctors are monitoring the immune systems of about 40 people to see how they react to an Ebola protein in the vaccine, the company said in a statement. Other treatments, including plasma from people who have recovered from Ebola, and the experimental drug ZMapp, are slated for testing by the end of 2014, the World Health Organization (WHO) said in a recent report. “We don’t know if the vaccines are going to work, and how well, and what the side effects will be, but we will get some information as we get into the New Year,” said Dr. William Schaffner, an infectious-disease specialist at Vanderbilt Medical Centre in Nashville, Tennessee, who is not involved with the trials. As for the outbreak itself, the virus continues to spread in Sierra Leone and Guinea, which had 1,166 and 1,187 deaths from Ebola as of Nov. 14, respectively, according to the CDC. However, cases may be dropping in some areas in Liberia. Reports released last week by the Centres for Disease Control and Prevention (CDC) suggested the number of new Ebola cases is now declining in two of Liberia’s 15 counties. For example, in Lofa County, where Liberia’s outbreak began, Ebola cases decreased from a peak of 153 new cases a week in August, to four new cases during the week that ended Nov. 1, a CDC report found. Since September, Liberia’s Montserrado County, home to about 1.5 million people, has seen a 73 percent decline in admissions to Ebola treatment units, a 58 percent decline in blood samples testing positive for Ebola and a 53 percent decline in the number of bodies collected, the CDC found. An increase in Ebola treatment units, safe burials and public education may have helped stem the virus’ spread in these counties, researchers said. People in these areas are still coming down with the disease, and the virus is also spreading to rural areas in Liberia, which are hard for medical personnel to reach. In the past few weeks, doctors have reported one new cluster of cases per day in these regions, the CDC said. Still, the declines in the two Liberian counties suggest that medical and humanitarian help are slowing the epidemic, officials said. In Mali, 28 health care workers are now under observation after they had contact with a patient who died of Ebola at their hospital. This is Mali’s second wave of Ebola. On Oct. 24, a 2-year-old girl who had come to Mali from Guinea died of the disease. In a separate case at about the same time, an ill 70-year-old man traveled from Guinea to Mali’s capital Bamako to receive treatment, the WHO reported. The man had acute kidney failure, a complication common in late-stage Ebola virus, but the clinic did not test him for the disease. He died on Oct. 27, according to the WHO. A nurse who had cared for the man died of Ebola virus on Nov. 11, and several of his family members have also tested positive for Ebola, and some have died. Shiveluch (Kamchatka): A series of eruptions occurred during the past days from the volcano’s growing lava dome. Tokyo VAAC issued alerts about ash plumes rising up to 30,000 ft (9 km) altitude. Bad weather prevented detailed observations, but most likely, several explosions and/or avalanches with pyroclastic flows occurred. Ash was dispersed to southerly directions. Sinabung (Sumatra, Indonesia): The volcano continues to produce occasional (generally smaller) pyroclastic flows triggered by collapsing parts of the still active lava lobe on the upper southeastern flank. Dukono (Halmahera): A more intense explosion occurred at the volcano, sending an ash plume to estimated 2.4 km altitude this morning (VAAC Darwin). The plume drifted 15 km to the south. Reventador (Ecuador): Activity at the volcano continues with little changes. Occasional small explosions are being reported to occur from the active lava dome in the crater. Copahue (Chile/Argentina): The volcano remains restless. Intermittent small to moderate ash emissions from the El Agrio crater and night-time glow continue to be observed at the volcano. SERNAGEOMIN keeps the alert status at yellow, apparently because no other monitored parameters indicate more elevated activity to be expected soon.